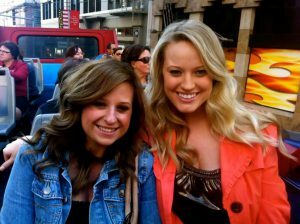 Sarah Kinsler,MarketingMel assistant and Mel’s intern Kristen Pierce, leaders in the next gen social networkers. The once great love affair between America’s youth and Facebook is over. The social network, once the “craze” for teens a few years back, has slowly turned into a ghost town when it comes to high school aged kids. Why you ask? It’s simple. Now that Facebook has become the chosen network for the middle aged and even seniors, teens are feeling a little “crowded.” Now they aren’t sharing info, updates, jokes with just their friends, but with Grandma too! Another reason of course is teens are all about chasing new trends and being involved in the newest networks. So adios Facebook and Hello Snapchat, vine and Tumblr. Snapchat, a mobile app sharing service, lets users take short video and photos, then allows users to send as a message.The unique thing about this app however is that once the message is seen, for a very short amount of time, it self destructs (or so teens believe). This is huge right now because teens find it fun that they can live in the moment and not worry about the consequences of a photo/video being taken for a permanent record. Tumblr is also very big right now. This app is for photo blogging and creating fun profiles that represent the user. It provides teens with a since of creativity without the extended family watching their every move. To listen to more of our discussion on youth and social media trends please listen to our podcast. Prior to the podcast Mary Ellen posted on both her Facebook business and personal pages about youth leaving Facebook and got a resounding “yes” from parents who agreed. What trends are you seeing in social networking and youth communications these days? Glad you are around to keep me up on the latest trends. Since I don’t have teenagers to chase, it doesn’t matter where they want to hang out other than for marketing purposes, ha! Sue I think it’s really important to watch the teenagers to see where trends are heading. Thanks for your comment. Wow! I had no idea about Vine, but I can see why teens are moving towards these types of social media sites and tools. Thanks for always keeping us in the loop! Sarah I am glad you found these tips useful. This just shows that nothing is static in business. So does one chase the latest fad or keep doing what’s working? Bill, great question. I think that you have to maintain what is working WHILE embracing change and being open to new technologies. I totally agree with this post. As a young adult I find myself separating from social media more and more. It tends to takes up too much of my time and becomes more of a distraction than anything. The people I want to stay connected with I do through more personal means. A couple weeks ago a woman asked me how I stay “in the know” when I’m not socially connected or watch much tv. She looked utterly shocked when I told her personal communication. I love digital but a meaningful conversation beats it out everyday. Dene that is so interesting that you are choosing interpersonal communications as your preference in a digital age. How very refreshing!